I was already excited about Dan Murphy but this news has me positively giddy. This will ensure that his RBI and Runs totals are approaching the century mark. I see his value approaching $20-25 which is awesome considering his 216.17 ADP in NL-only leagues. Daniel Murphy recently took some ribbing from teammates after adding his few-year-old Honda Civic to a sign-up sheet for transport to New York. After all, the car stood out on a list that included new Mercedes, BMWs and Cadillac Escalades. Murphy, frankly, is more concerned with his hitting. And it's his bat that will land him in the No. 2 spot in the Mets' lineup on Opening Day and beyond. 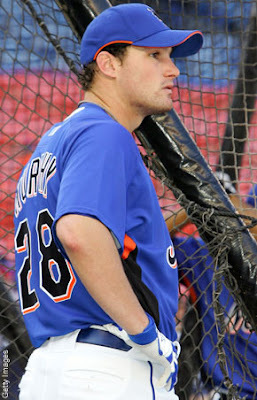 Despite only 131 big-league at-bats on his resume, Murphy's approach at the plate has impressed Jerry Manuel so much that the skipper plans to place Murphy directly after Jose Reyes in his lineup. The plan would also entail placing Luis Castillo in the No. 8 hole. Manuel didn't list his complete lineup, but it's reasonable to expect Murphy would be followed by Carlos Beltran, Carlos Delgado, David Wright, Ryan Church, Brian Schneider, Castillo and the pitcher.